Despite the emergence of highways, shopping malls, frighteningly deep pits and even moats around them, the tenacious owners of these older structures refused to give in to developers, remaining in their increasingly incongruous homes. 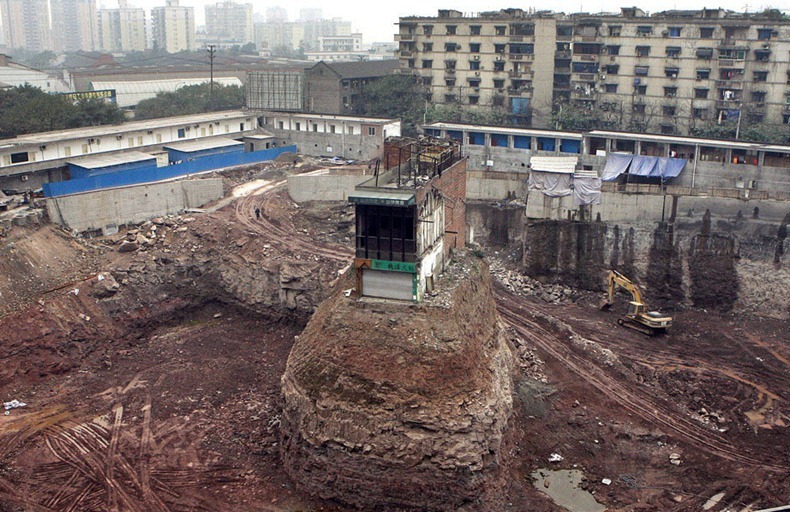 In China, they’re referred to as ‘nail houses,’ like stubborn nails in wood that can’t be pounded down; American developers call them ‘spikes.’ Most of them are ultimately demolished, but some stand like strange little monuments to the past. Framed on three sides by concrete, Edith Macefield’s tiny cottage in the Ballard neighborhood of Seattle is strikingly out of place. 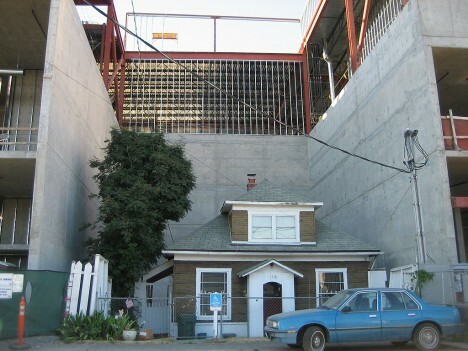 But really, what’s out of place is the development that has sprung up around her 108-year-old farmhouse, which served as inspiration for the Pixar movie ‘Up’. Macefield purchased the house in the ’50s and lived there until her death in 2008, even after the rest of the homes on her street were gone, refusing to give in to developers who ultimately ramped up their compensation offers to $1 million plus a new home and nursing care for the rest of her life. Macefield felt she was too old and frail to move. But during the last years of her life, she struck up a friendship with the superintendent of the construction project, and left her home to him. Instead of allowing it to be swallowed by the complex, he sold it to someone who turned it into an office. As of 2014, the house still stands. 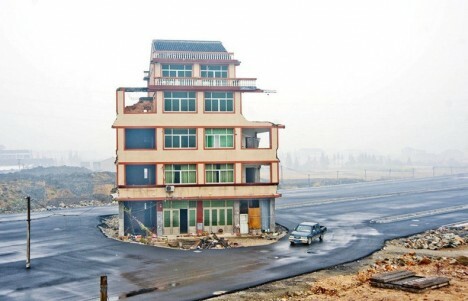 Drivers cruising along a highway in Wenling, China, had to slow down and drive around one heck of an unusual roadblock: the five-story home of duck farmer Luo Baogen, the sole holdout from a neighborhood that was demolished to make way for the new thoroughfare. When Luo refused developers’ offers, they simply built around him, assuming that being in the middle of a construction zone and later, a highway would drive him out. In the end, it was all the media attention that did it. Despite having paid $95,000 to build it just a few years earlier, Luo accepted an offer of $41,000 and consented for the house to be razed. What happens when multiple people own space in a single building, and some sell while others won’t? In some cases, builders literally tear down everything but the sliver of the structure belonging to the holdout. 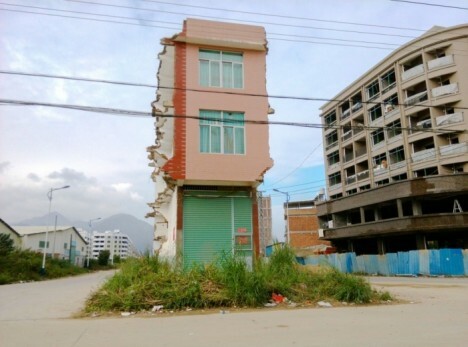 This jagged nail house at a crossroads in Pinghe, China is all that’s left of an entire apartment building. 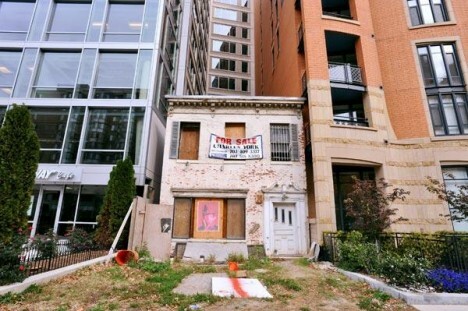 Austin L. Spriggs House, Washington D.C.
A tiny townhouse clung to its little plot of land in Washington D.C. even as a four-story-deep crater appeared around it, with just three feet of earth separating its walls from a 40-foot drop-off. Owner Austin L. Spriggs, who used the building as an office for his architecture firm, refused to even engage with the developers, who finally decided they would just build around it. It’s now a curiosity crammed between condos and commercial buildings. In 2011, it sold for $800,000 to someone who plans to turn it into a restaurant.